1 >> I sliced a potato that we had in our pantry using this mandolin and lined the bottom of the pan with the thin slices. *Optional, of course! 2>> I added a whole bunch of kale on top of the potatoes. 3>> After chopping up the sausage and veggies I added them on top of the kale + potatoes. 4>> Whisk the eggs and add in your spices. I initially only used 10 eggs and then had to continue to add more to cover all my veggies. The pan I used was huge, so I think I ended up using 15 eggs (11 eggs, 4 egg white). 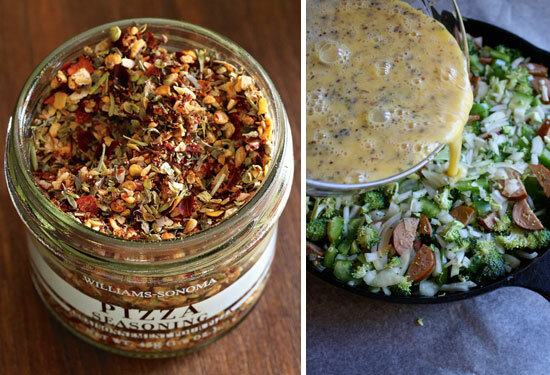 I also used the Williams Sonoma pizza spice mix (pictured below) to add some good flavor! The mix has the following ingredients: Garlic, sun-dried tomato, California chili, cayenne pepper flakes, onion, sea salt, basil, oregano, rosemary, thyme, black pepper. 5>> Pour eggs & spices over your veggies. Your eggs should cover all your veggies. Add more if you need to. 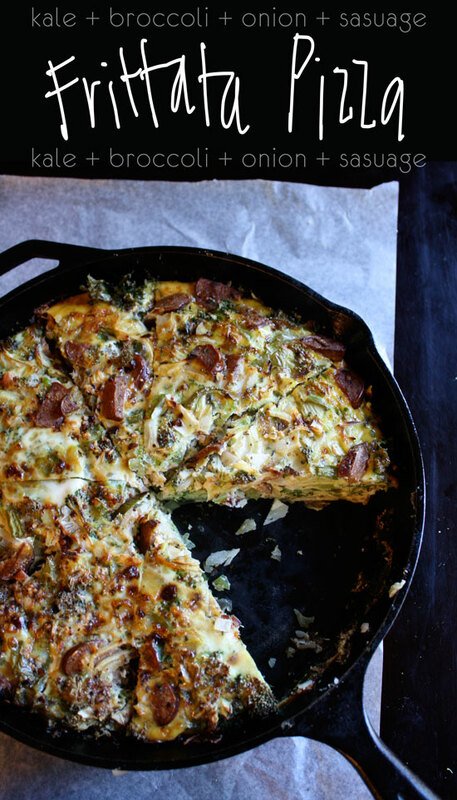 6>> Finally, bake your frittata for about 40minutes. Mine was really thick. I ended up broiling it for 7-8minutes at the end to finish cooking the center/top. You'll have to play around with the time depending on the size/thickness of your pan. 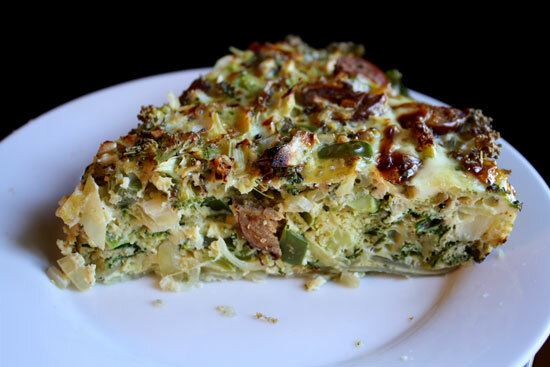 Like I said above, I ate my frittata slice with a bit of pesto on top! I was surprised how easy this meal came together. We'll probably have it for breakfast every day this week. That thing is a beast!! It's like 3 inches thick! haha. 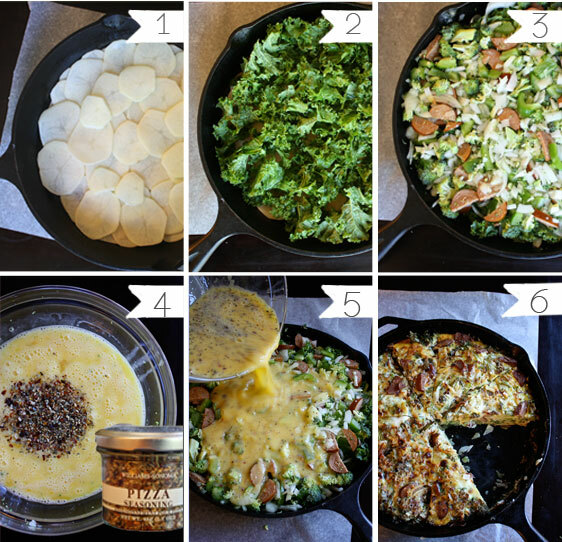 I'm sure you could make a frittata in a lasagna pan, too, or a ceramic baking dish. At some point I want to try it with butternut squash layered on the bottom, or sweet potatoes layered throughout and maybe add in a little cheese next time. Yes. Yum. Enjoy!! !